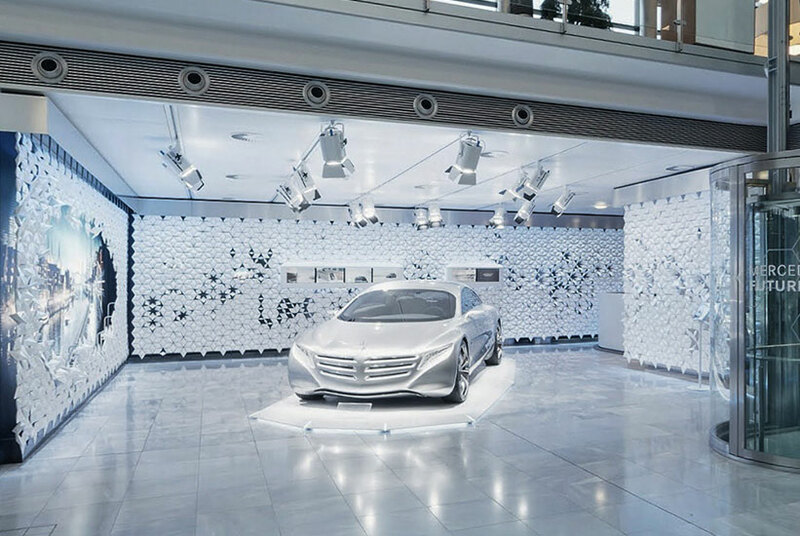 Take a look at the Mercedes-Benz museum in Bremen, Germany, where our wall screen design, Facet, is installed. 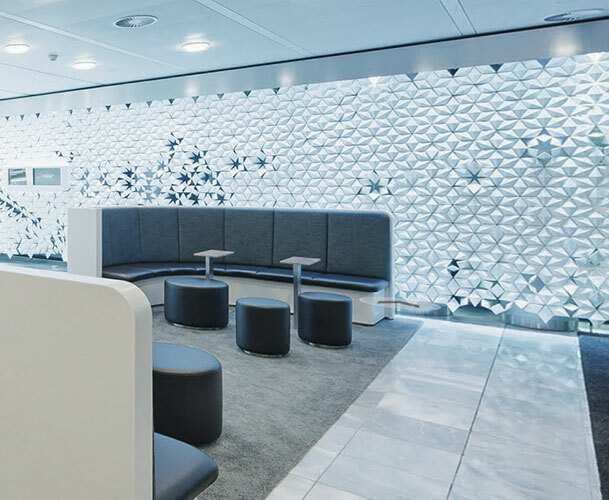 Some of the wall screens have open spaces where one can look through and see futuristic images of Mercedes-Benz appear as though you were looking through a time rift. Endless creativity with this wall screen design. Facet has a breathtakingly beautiful pattern that makes any setting look fantastic. Not only does it form an eye-catching piece of decoration; it is also a fully modular system which means you can modify it to work perfectly in your specific project. We can make Facet in any size you want. If you want it to cover an entire wall, we can do it. We offer it in certain standard sizes, but it is possible to make it in any size that you need, just contact us! We can also leave a certain space open in the screen so that you can place your logo there or a screen like at the Mercedes-Benz museum. And once you have Facet, you can continuously modify the screen by turning the diamond-shaped elements around. By doing that you change the pattern and the look of the screen, but you also make it possible for more or less light to shine through the screen. Our wall screen design, Facet, is a lightweight product, making it easy for you to install it yourself. The smart design of the ceiling attachments means that you only have to attach one screw per attachment. And it is can be attached to any type of ceiling. If you can hold a screwdriver and read a step-by-step instruction manual, then you can install it! The ceiling attachments of this wall screen design are available in brushed stainless steel. The screen itself is available in a variety of sophisticated colors. Go for the classic white of you want to brighten up your place, or go for cayenne to add warmth. If you want a very specific color, take up contact with us and we will see what we can do. We want our customers to be 100% happy with their purchase and do not mind to go the extra mile to achieve that. The images on this page are made in the Mercedes-Benz museum in Bremen, Germany. 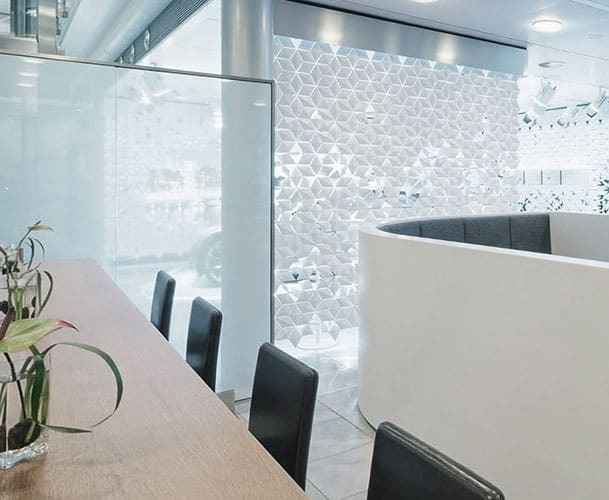 Facet is used as a semi-transparent wall. It looks astonishing all along the walls and it emphasizes the innovative design of the cars. The well-made construction and the striking pattern of Facet work perfectly together with the brand.